Gambas is a free development environment aims at making a graphical development environment based on a Basic interpreter, so that we have a language as easy as Visual Basic™ under Linux™. Gambas3 is available in Ubuntu Software Center since Ubuntu 12.10 Quantal, but it’s a little old. The latest Gambas 3.5 was released on October 22 with more than 240 bugfixes and more than 270 new features. See the official release note. 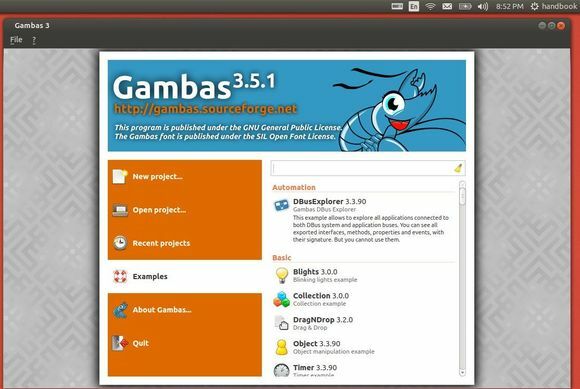 This tutorial show how to install the latest Gambas 3.5.1 in Ubuntu 14.04, Ubuntu 13.10, Ubuntu 13.04, Ubuntu 12.04 and Linux Mint via PPA. Thanks Bro! it really helped me since I’m an ubuntu linux user. I don’t want to duable boot on windows for visual basic since I’m quite lazy. Thanks! An update: use “sudo add-apt-repository ppa:gambas-team/gambas3” instead “sudo add-apt-repository ppa:nemh/gambas3”. The latter is deprecated. thank you Ji m for sharing this info. after a few hours searching, your post solved my problem. appreciated. Thank you so much for being a credit to the Ubuntu community! by following these instruction (steps) gambus is not properly install in ubuntu…. Gambas 3.8.90 installed OK but the New project window doesn’t display any Project Types. The Title in this window is 1. Project type. Have looked everywhere but can’t find a fix for this problem.